Painting has taught me how to see. The door to a new dimension has opened —light against dark, negative space, shapes as opposed to objects, and above all, COLOR. My life will never be the same. 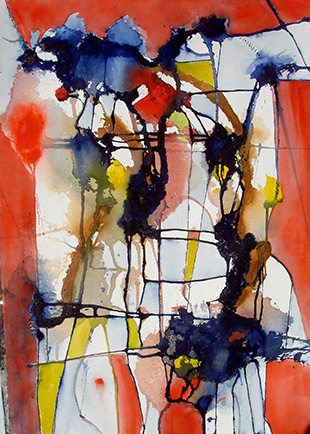 Jan Wright began painting watercolor almost 20 years ago. As she studied with various instructors, she found herself on a fascinating journey—traveling to hundreds of painting locations, viewing thousands of paintings and creating hundreds of her own. That journey has led her to embrace non-objective subject matter (although tree forms will always finish a close second). She believes we are hard wired for art. Every primitive society produced art, advanced societies value it and current art forms using new technology abound. Art is at the center of humanity. Visual art transforms the ordinary by combining imagination and creativity with visual experience and re-visioning reality. In addition to celebrating the familiar, the visual artist has an obligation to take viewers beyond the obvious by engaging them as participants in the re-visioning process. 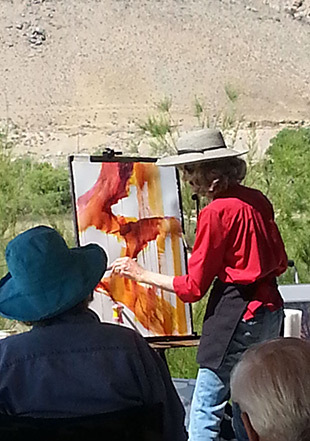 DEMONSTRATlONS: Sharing her strategies for watercolor and mixed-media painting, Jan demonstrates for art associations and other organizations which feature public presentations. Her entertaining, informative and enthusiastic delivery includes handouts and ongoing narrative about her process and techniques. Contact her at jan@genger.com for more information. WORKSHOPS: One to three-day workshops are available and can be tailored to the experience level and interests of the participants. They include group conversation about the process and individual conversations about the product. Since Jan is an experienced former educator and administrator, the material is well organized and clearly presented. She has also conducted classes for students from elementary through high school and workshops for church groups and retreats. JUDGlNG: Jan provides written commentary based on criteria established by Ed Whitney and others providing valuable feedback to exhibition participants. She is focused, conscientious and efficient.